Skin scar removal using does not usually involve pain. Laser treatments may be a little uncomfortable, but they do not normally involve pain unless sensitive areas are being treated. If discomfort does occur you can ask for an anesthetic in the area to prevent this. Laser acne scar removal can show results much faster than many other methods available. You may see an improvement within two or three treatments, and even severe acne scars will improve over time. The treatments do not take more than fifteen or twenty minutes in most cases, and recovery is fast. Laser acne scar removal does more than just remove scars. These treatments eliminate bacteria which causes acne without requiring antibiotics or other drugs. The laser penetrates deep under the top layers of skin, where bacteria thrive and are hard to reach with many treatments. Oil is one of the causes of acne, because this condition is caused by excess oil and bacteria. Laser acne scar removal also helps eliminate excess oil production, because the oil glands are damaged and produce less of this clogging as a result. Lasers cause less inflammation than traditional surgical scar removal. This makes laser treatments ideal for keloid scar removal, because keloids are caused by inflammation and scarring. Traditional surgical methods may actually cause keloid scars to come back bigger. 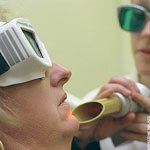 Laser treatment for acne scars are not risk free, and these treatments may have some risks associated with them. These risks can include inflammation, swelling, redness, and varying results. In rare cases more serious complications may occur with some procedures, and the treatment provider will outline any risks before your treatment is done. And, finally, there are some drawbacks involved with laser acne scar removal procedures. Your skin may become too dry, and irritation can cause redness which is unappealing.